The Homo genus, of which humans are the only surviving members, diverged from our more basic australopithecine ancestors about 2.4 million years ago with the emergence of Homo habilis. This species, the most primitive of our Homo ancestors, originated in Africa and is not thought to have left the continent during its roughly one million years of existence as a species. Homo erectus and Homo ergaster were arguably the two most successful species in the history of our genus, living for nearly two million years and only dying out less than 100,000 years ago. 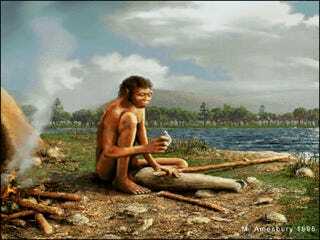 Indeed, it might be even more recent than that, if Homo floresiensis, the so-called "hobbits" of Indonesia that died out as recently as 13,000 years ago, really were erectus descendants. But from the African ergaster came a new species, Homo heidelbergensis, which first emerged in Africa about 600,000 years ago. Although heidelbergensis is now one of the more obscure hominids, they were a very advanced species, with brain capacity very similar to ours and some shockingly modern customs, including perhaps burial of their dead. They stood an average of six feet tall, and they were more muscular than we tend to be, making Homo heidelbergensis one of the most powerful members of our genus. Homo heidelbergensis probably supplanted Homo ergaster and then split off into a couple different main groups, similar to how ergaster and erectus had split apart about a million years previously. This spawned the second African migration, in which part of heidelbergensis left Africa and spread out into Europe and western Asia. By about 300,000 years ago, Neanderthals had emerged from these heidelbergensis migrants. 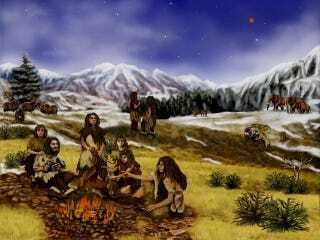 Neanderthals were close relatives of their heidelbergensis ancestors. Although Neanderthals were shorter, they retained the muscular build of their forebears, with similarly large brow-ridges and protruding face. Most scientists favor this model to the competing multiregional origin model. The latter theory holds that modern humans actually evolved from whichever group of Homo erectus had colonized their part of the world, creating a single continuous species with a global evolutionary history. This theory doesn't have many proponents, particularly because it's thought to have trouble explaining just how different groups of humans could have maintained their ability to interbreed while pursuing parallel evolutionary lines.